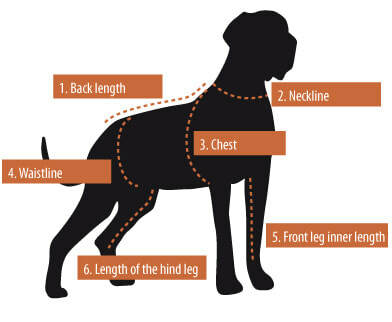 Measuring your dog ensures a proper fit when you are purchasing dog clothing. *The chest size is the most important measurement to choose a size by. Neck: Measure around th base of the neck. Chest: Measure behind the front legs, making sure you have the tape measure around the widest part of the chest, all around the body. Length: Measure from base of neck to base of tail. Earline: Measure on top of the head, between the ears.